active since March, 3, 2007. 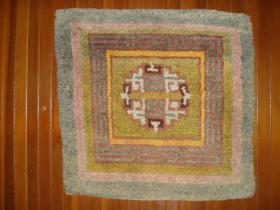 Sitting mat TIbet Late 19th Century Bent!! Gorgeous little Tibetan saddle carpet!!! 20 x 46 inches Great color. Great wool. An unusual variation of the warp-faced back weave.